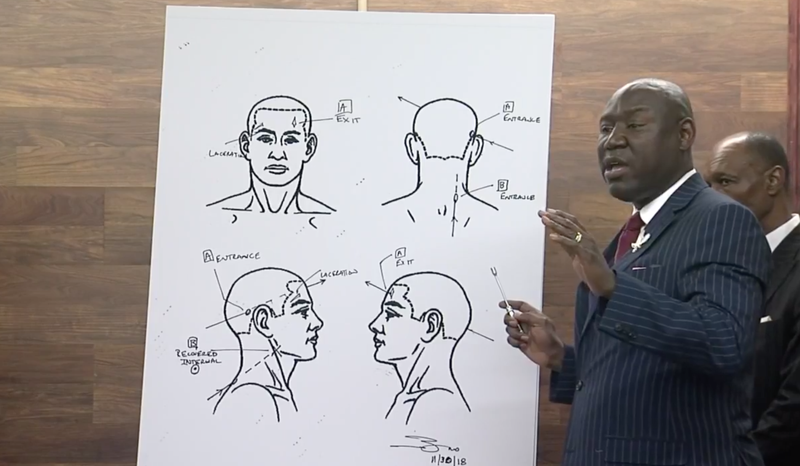 Minutes after the police department whose officer allegedly killed Emantic “E.J.” Bradford, Jr. in a Thanksgiving mall shooting, the Bradford family held a press conference disclosing the results of a medical examination that revealed a reality that might have been worse than the initial rumors and suppositions surrounding Bradford’s death. After Hoover, Alabama’s lone black councilman, Derrick Murphy, requested that the HPD and the city of Hoover release any video of the incident, on Monday morning, Hoover Police Chief Nick Derzis announced that the city would adhere to the Alabama Law Enforcement Agency’s (ALEA) wishes to not release any video. Less than an hour later, Bradford’s family and attorneys held a press conference releasing the results of an independent preliminary medical examination of Bradford’s body conducted by Dr. Roger Mitchell Jr., MD. at the request of the family. According to the report, Mitchell met with Jefferson County’s chief medical examiner to review all of the forensic evidence and medical reports, including, x-rays photographs of the body at the scene, autopsy photographs and the body itself. The pathologist determined that the 21-year-old was shot from the back, moving away from the police officer who shot him. While the report did not establish an order of the gunshot wounds, the report noted three gunshot wounds which were all “kill shots.” One bullet entered the right rear of Bradford’s head, traveled through the brain and exited out of the other side, according to the preliminary examination. Another entered the base of his neck from the rear and a third entered his rear right torso, just above the hip. These two remained lodged inside Bradford. Numerous witnesses had concluded that Bradford was shot in the face, including the victim’s mother and Crump, who expressed that supposition to The Root in an interview last week. However, the medical examiner determined that the injuries to Bradford were a result of him falling forward on his face with dead weight after he was shot. The independent examiner ruled the cause of death as a gunshot wound to the head, and the manner of death as homicide. Because of the graphic nature of the report, E.J. Bradford’s mother and stepmother did not attend the press conference. But Bradford’s father, who worked with Jefferson County’s law enforcement as a correctional officer, spoke at length about his feelings on the death of his son. Crump added that ALEA’s said their decision not to release any video was based on the fact that there are potential witnesses who they have not interviewed. Local residents outraged by the shooting have vowed to target Hoover with protests until the city releases any footage of the incident or charges the officer with Bradford’s death. A group demonstrated at a local movie theater on Sunday, forcing the theater to stop selling tickets for the evening.